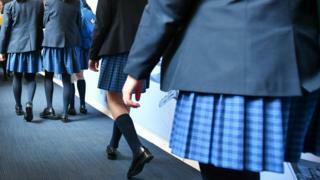 One in three girls in the UK has been sexually harassed in public when wearing school uniform, a new report has suggested. And two-thirds of girls say they have experienced unwanted sexual attention in public, it adds. The figures come from a report by children’s charity Plan International UK, which said many girls feel street harassment is “all part of growing up”. It is calling on bystanders to challenge harassment when they see it. The report surveyed more than 1,000 teenagers and young women aged 14 to 21, and also carried out interviews with girls and academics. The report features stories from several young women, including 19-year-old Malikah, from Birmingham, who said she was followed by someone in a car while walking alone. “My phone was upside-down, but I pretended to be on the phone and was trying to make out like my dad was coming to pick me up,” she said. Hollaback! – an international movement tackling harassment – says there is no right or wrong way to respond. Be firm: Look them in the eye and denounce their behaviour with a strong, clear voice. Say what feels natural: The important thing is that you are not apologetic in your response. Don’t engage: Harassers may try to argue with you or dismiss you through further conversation or by making fun of you. As tempting as it may be get into a verbal war with them, it is not recommended. The attention may further feed their abusive behaviour. Keep moving: Once you’ve said your piece, keep moving. Harassers do not deserve the pleasure of your company. The charity is calling on the government to recognise street harassment as a type of “gender-based violence”. The chief executive of Plan International UK, Tanya Barron, said it was “shocking and deeply concerning” that girls who are clearly of school age are being sexually harassed. “It’s simply not acceptable that girls as young as 12 are being wolf-whistled at in public, touched against their will, stared at or even followed,” she said.